The Industrial Revolution. A time when a strong work ethic, a sharp mind and a little elbow grease was enough to take a man from rags to riches. 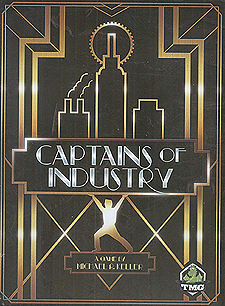 Do you have what it takes to become a captain of industry? Use seven different types of facilities to feed the fires of the Industrial Revolution! Play to your captains' strengths to blaze your own path to greatness! Keep an eye on the progress track or you might find yourself behind the times!